Tip: During the test and tune process, keep track of which springs help or hinder your carburetor’s performance. They make it easy by color-coding the top of each spring. Here’s what you’ll net: ability to change and custom tailor your secondary fuel delivery in a matter of seconds. 1: We start by removing the four bolts of the original spring housing. Be careful not to snag or tear the diaphragm underneath when lifting off the lid. 2: Leave the old boot in place and realign the bolt holes if necessary. The new housing will drop right in on top (2 bolts). 3: Picking up the other two mounting holes is the quick-change lid. With a slight recessed groove on the underside, the vacuum springs simply pop and lock into position. It really could not be any easier. We have all heard it a hundred times, yet it still remains a back and forth issue with many performance enthusiasts- mechanical or vacuum secondaries? What’s it going to be? Well, it’s not always such a clear-cut thing. It really depends on what your primary goals are for your vehicle. If all-out performance and serious racing is your thing, then we would probably recommend a mechanically actuated double-pumper. These carbs are virtually foolproof. Without a doubt, they consistently deliver a greater volume of fuel every time you stomp on the pedal. On the other hand, if you prefer walking the fine line of practical streetability and high performance, then a vacuum assisted carburetor might be your winning ticket. Although often disregarded as a true “performance” carburetor, the vacuum secondary Holley is one of the most flexible and easily tunable units around. As popular as it may be, the vacuum secondary carburetor is not without its own set of problems. The chief complaint made by most always has to do with the slow speed or late timing in the opening of the secondaries. Fortunately, the user-friendly design of these carburetors allows instant adjustments to be made utilizing a variety of diaphragm springs, each with a different rate of resistance. By changing the spring inside the housing, the opening rate of the secondaries is dramatically affected. The lighter the spring, the faster the bores will open and allow the fuel to be delivered. In contrast, a heavier spring will prolong the opening. Ideally, you want the lightest spring possible without causing your motor to stumble or bog-out. Keep in mind this depends entirely on the rest of your car (i.e. ignition timing and advance, cam profile, vehicle weight, rear axle ratio, etc.). Needless to say, there are infinite possibilities here. The only tried and true way to know for sure what works best is to simply hit the track! Make only one adjustment at a time and document your results. In addition to your own notes, save your time slips as well (even the embarrassing ones). You never know– they may serve as a helpful point of reference in the future. Now getting down to the conversion. 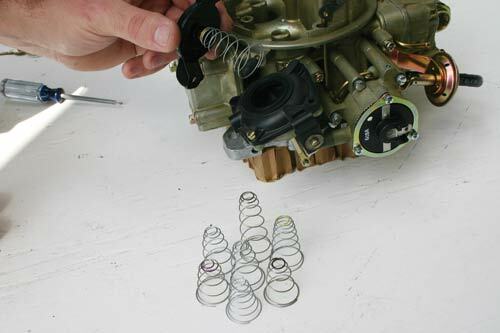 To avoid losing any small parts or hardware, take the extra five minutes and remove the carburetor from the engine. As you can see in the pictures shown, the whole swap is really just 3 basic steps. In fact, only the lid of the original setup is substituted. By eliminating this single component and replacing it with the new, two-piece cover (see photo 3), you are literally able to change your carb’s vacuum springs in seconds! Perfect for those crowded, busy days at the drag strip. For a measly twenty bucks and thirty minutes (if that), this quick-change kit is a no-brainer, and easily adapts to any Holley vacuum secondary carburetor. An absolute must for all of you performance tuners.